Industrial economies are changing globally, shifting job availability and land occupation while generating opportunities to re-envision past city planning efforts. 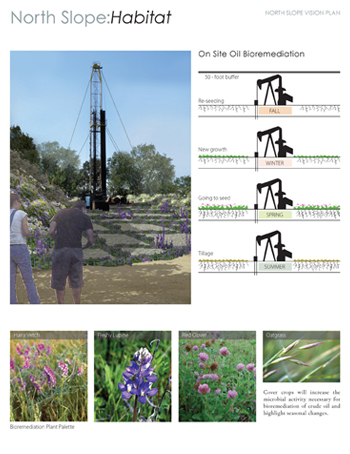 As the iconic oil fields and pumps transition out of production, the City of Signal Hill has new opportunities to connect people to their environment and community through sustainable planning practices. This project introduces approaches to repurposing these lands balancing economic, community and ecological interests while creating vibrant, viable spaces in the urban context. Signal Hill is both a geographic feature and a city located in the Los Angeles basin within the boundaries of the city of Long Beach . The Los Angeles basin cities now have adjoining boundaries, preventing any outward expansion as population grows. Consequently, redevelopment of urban land is increasingly the only option to meet growing community needs. Past planning practices, in this region, have ignored ecological processes and a community's need for open space. Also, concerns for the quality of life and the connection between the community and its environment have spurred local cities to reexamine past development practices. The city of Signal Hill is at one of these crossroads, a proverbial fork in the road. During redevelopment of urban lands, a new direction for this region and the City of Signal Hill based on sustainability principles, can balance the ecological, community and economic systems. Oil production has been the largest industry for the city of Signal Hill and is intertwined in the city's identity. Oil extraction has dominated the landscape in this city both visually and economically. As the nature of oil extraction has changed and extraction activities have diminished, availability of these lands for development has increased. However, past extraction practices coupled with past development trends have changed local ecological and community patterns. Pockets of land created by fault zones, cross the city forming connections between these industrial and oil lands. Fueled by the need to diversify their commercial and industrial incomes and the increased pressure from a growing population, oil lands and fault zones are being repurposed for alternate uses, but past city planning practices are inadequate to create the needed green infrastructure that will create viable, sustainable systems. The Hill is a regional icon and the center of local activities. As one of the highest points on the coastal plain, it draws daily exercisers, weekend sunset watchers, and a variety of plant and wildlife. The North Slope of the Hill, currently under production for oil, is the largest remaining undeveloped land in the city of Signal Hill. The owners of this property are considering developing this land for housing but the community has expressed the wish for the city to explore alternative uses for this land. During data collection and analysis, project issues were identified in the following four categories: Ecosystem Function, Open Space, Development and Oil Extraction. The city of Signal Hill and the site of the North Slope of Signal Hill present the opportunity to look at impacts at a regional level and how one city and one site can become a model for future sustainable redevelopment of pockets of industrial lands. The City of Signal Hill is poised to utilize the Plan for the sustainable development of the North Slope and other industrial lands in transition along the Green Spine. 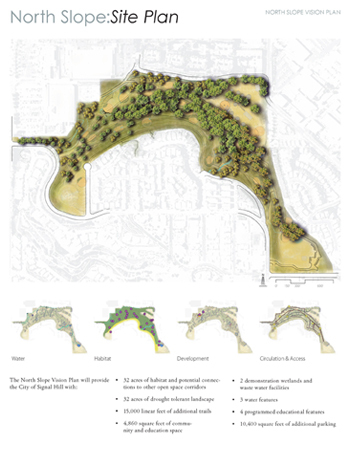 After examining the issues related to this project and applying the Green Spine Principles, the resulting goal for the North Slope of Signal Hill is to create a community open space that balances ecosystem function, development, and oil production in a manner the land can support into the future. Improve ground and surface water quality. Remediate soils polluted by oil extraction. 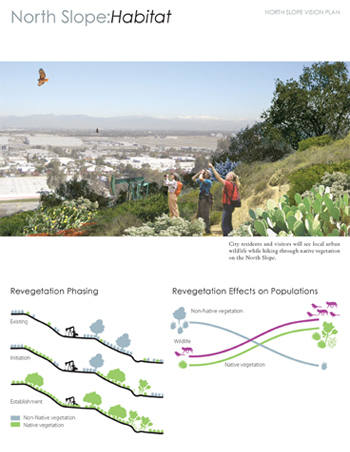 Increase habitat connectivity within Signal Hill. Develop strategies to manage invasive plant species. Increase opportunities for the establishment of native wildlife species. Balance sustainable development, with open space, and current industrial land uses. Minimize increased demand for water associated with the development of the North Slope . Develop site to minimize risks from geotectonic activity. Develop site to stabilize slopes. Balance stakeholder input to accommodate open space, oil production, and development on the North Slope of Signal Hill. Increase open space to improve public recreation opportunities. 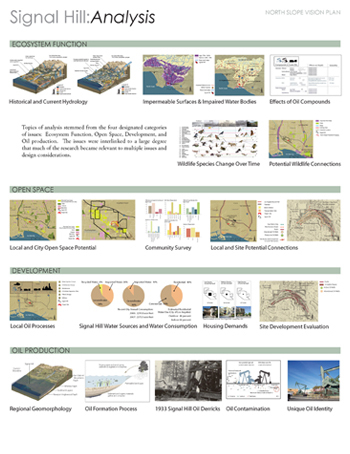 Develop site to minimize risks associated with oil extraction activities. Provide opportunities to learn about the site's history and wildlife, oil formation and extraction. 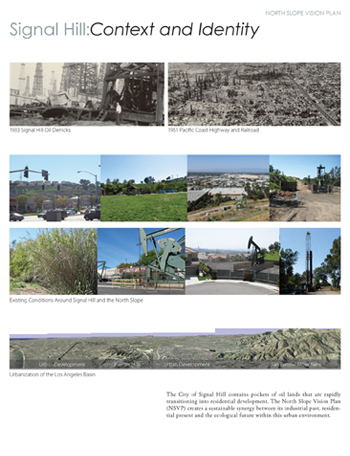 Preserve Signal Hill's historical identity as a unique place for oil extraction. The analysis and dissemination for the North Slope Vision Plan was accomplished in four stages: research and inventory, analysis, synthesis and conceptual vision, and conceptual plan design. 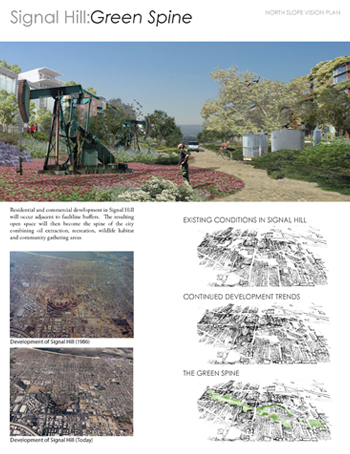 Through the course of the first stage, the studio team developed an understanding of the stakeholder concerns and objectives, the city of Signal Hill and the North Slope of Signal Hill. Objectives were established and further refined during subsequent phases. Data was gathered and analyzed at four scales: watershed, local, city and site. These scales were designated to maintain data in its scale of relevance and to illustrate relationships with adjacent areas as needed. Areas of data were gathered for the following categories: geomorphology, climate, soils, hydrology, habitat, development and community. Matrices of the collected data were developed to associate each issue and its correlating objective. In addition, a public survey was completed on the Hill by the team to gauge interest in and future expectations for the North Slope. Green Spine Principles were developed to guide future planning efforts in this region. Green Spine principles aim to achieve a balance between development, natural process, and community identity, encouraging a sustainable approach to redevelopment and improved quality of life. The core of the Green Spine evaluation principles can be found in three theories of planning and design. 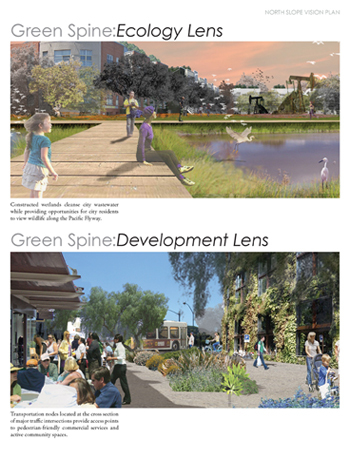 These are the "Ahwahnee Principles for Resource-Efficient Communities," "Greenway Theory," and "Landscape Urbanism." To realize these combinations of land uses and to gain from preserved open space, the principles of the Green Spine evaluation tool are distilled into three lenses: an Ecology Lens, a Development Lens, and a Community Lens. Each lens is a categorization tool that focuses the analysis through the Green Spine principles for evaluation of properties considered for development. This helps the evaluator address complex systems and issues within a systematic approach. Ecological resources can be planned, designed, and managed to exist synergistically. In time, redevelopment of urban areas will depend on the integrative value of what some landscape designers and planners are calling a "green metastructure," or green infrastructure, to address expected urban population increases and the lack of undeveloped land to support them. The Community Lens principles will create linkages that increase the City's appeal, making it a more attractive draw for commercial activity from residents outside the City. The community lens principles link historic resources like the existing cemetery and oil extraction sites for further education about the region and ground the identity of the City of Signal Hill with its history. These principles look at making links and connections through the extension of existing programs, while maintaining equal access to open space and encouraging health initiatives. The site design acts as a keystone for the Green Spine. 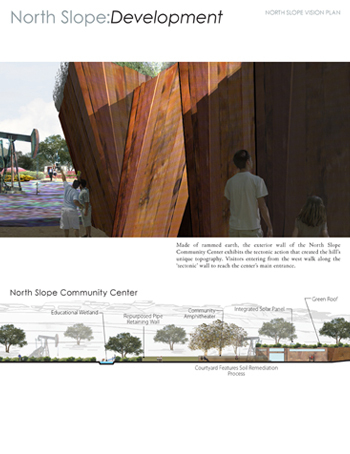 Located at the apex of the Spine, the North Slope represents a center of community activity and the opportunity to apply sustainable concepts to a repurposed site. The design of the North Slope was divided into four sections. The design elements for water on the North Slope will highlight the existing anthropogenic and hydrological processes on site. Features include on-site wastewater treatment wetland, use of run-off from adjacent sites and features designed to expose the role of water in the function of the site. Habitat design will capitalize on the location of the North Slope in the Pacific Flyway and increase native plant and animal communities. 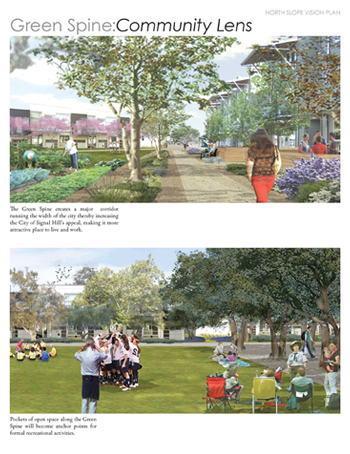 Unique features of the habitat design include a phasing plan to replace non-natives with natives especially trees, a buffer zone between the local housing development and native communities and bioremediation areas that use plants to increase soil porosity, and quality to encourage bacterial consumption of oil present in the soil. Development on the North Slope revolves around a community center embedded into the hillside and educational opportunities. The features include a tectonic wall of rammed earth, use of local materials in retaining walls, bird observation platforms and information on sustainable practices throughout the site. Circulation design uses the existing oil well access roads to limit additional grading. Features include nodes for way finding and gathering. Erosion mitigation techniques will be applied to existing paths and bicycle facilities will be introduced in strategic areas. The development of the design and of the site will be implemented in phases. The phasing time of the North Slope will be determined after future investigation by the City of Signal Hill of acquisition opportunities, regulation compliance, and permit requirements. 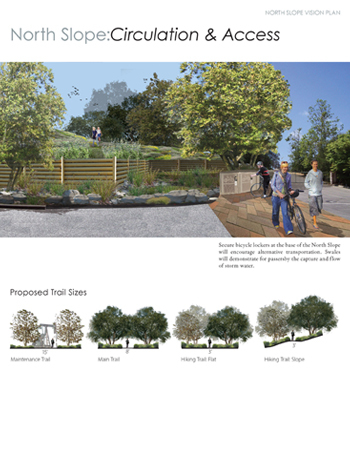 The City has begun by acquiring areas around the North Slope of Signal Hill, and is in process of implementing initial planting phases of the plan. The community center on the North Slope will monitor progress of the designed systems as part of the educational component. 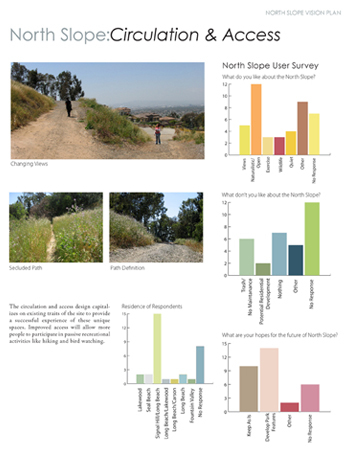 Addressing the complexities involved in combining development with extractive and passive land use programs, the North Slope Vision Plan is an important and timely project for the urban Los Angeles and the profession of Landscape Architecture. The combination of a complex set of stakeholder relations and the difficulties of reclaiming dramatically altered land engenders the most recent challenges to landscape architects designing in an urban environment. Signal Hill: Context and Identity. The City of Signal Hill contains pockets of oil lands that are rapidly transitioning into resident development. The North Slope Vision Plan (NSVP) creates a sustainable synergy between its industrial past, residential present and the ecological future within this urban environment. Signal Hill: Analysis. Topics of analysis stemmed from the four designated categories of issues: Ecosystem Function, Open Space, Development, and Oil production. The issues were interlinked to a large degree that much of the research became relevant to multiple issues and design considerations. 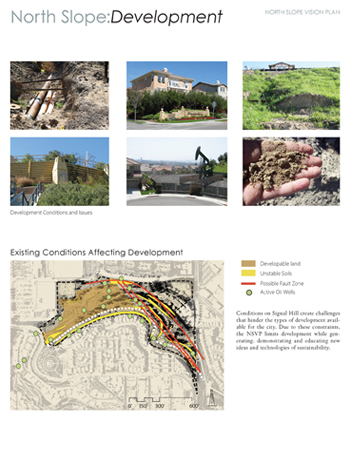 Signal Hill: Green Spine: Residential and commercial development in Signal Hill will occur adjacent to faultline buffers. The resulting open space will then become the spine for the city combining oil extraction, recreation, wildlife habitat and community gathering area. Green Spine: Ecology Lens. Constructed wetlands cleanse city wastewater while providing opportunities for city residents to view wildlife along the Pacific Flyway. Green Spine: Development Lens. Transportation nodes located at the cross section of major traffic intersections provide access points to pedestrian-friendly commercial services and active community spaces. Green Spine: Community Lens. The Green Spine creates a major corridor running the width of the city thereby increasing the City of Signal Hill’s appeal, making it more attractive place to live and work. Pockets of open space along the Green Spine will become anchor points for formal recreational activities. North Slope: Water. Impairment of the local waterways is attributed to the polluted runoff caused by urbanization. The NSVP will help highlight existing hydrological processes on site. 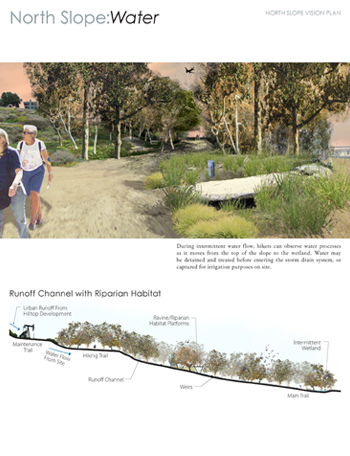 Repurposed pipes and bioswales will convey and cleanse urban runoff as it flows to cisterns for future on site use. North Slope: Water. During intermittent water flow, hikers can observe water processes as it moves from the top of the slope to the wetland. Water may be detained and treated before entering the storm drain system, or captured for irrigation purposes on site. "Really good ideas and amazing graphics. Nice processes that were well done. The integration of the industrial program in a park is very much in line with what has to be happening." North Slope: Habitat. Signal Hill has gone through a significant change over the past 100 years. 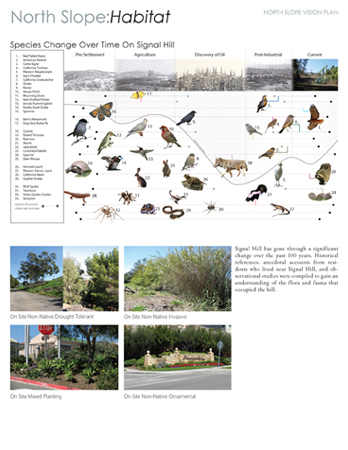 Historical references, anecdotal accounts from residents who lived near Signal Hill and observational studies were compiled to gain an understanding of the flora and fauna that occupied the hill. North Slope: Habitat. City residents and visitors will see local urban wildlife while hiking through native vegetation on the North Slope. North Slope: Habitat. Cover crops will increase the microbial activity necessary for bioremediation of crude oil and highlight seasonal changes. North Slope: Development. Conditions on Signal Hill create challenges that hinder the types of development available for the city. Due to these constraints, the NSVP limits development while generating, demonstrating and educating new ideas and technologies of sustainability. North Slope: Development. 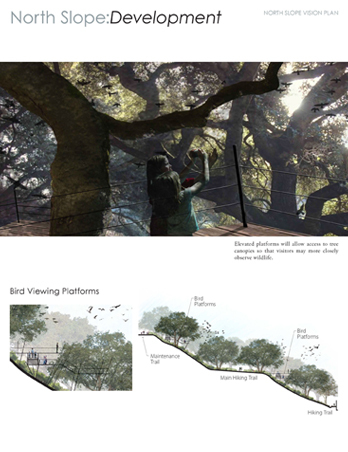 Elevated platforms will allow access to tree canopies so that visitors may more closely observe wildlife. North Slope: Development. Made of rammed earth, the exterior wall of the North Slope Community Center exhibits the tectonic action that created the hill’s unique topography. Visitors entering from the west walk along the ‘tectonic’ wall to reach the center’s main entrance. North Slope: Circulation & Access. Secure bicycle lockers at the base of the North Slope will encourage alternative transportation. 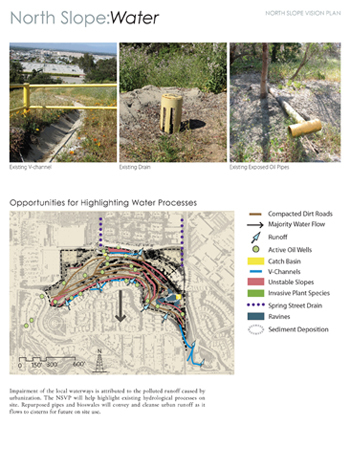 Swales will demonstrate for passersby the capture and flow of storm water. North Slope: Circulation & Access. The circulation and access design capitalizes on existing traits of the site to provide a successful experience of these unique spaces. Improved access will allow more people to participate in passive recreational activities like hiking and bird watching.